In a city of historical buildings, the Prunksaal (State Hall) of the Austrian National Library might just be the single-most impressive room in all of Vienna. 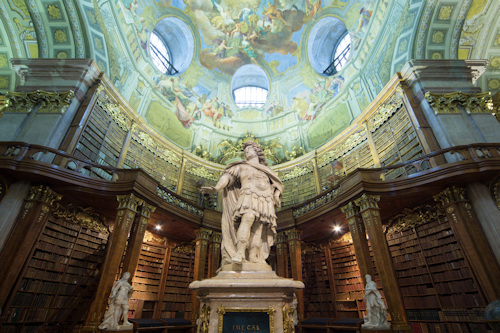 The National Library’s State Hall (Prunksaal) is a library room in the same way that the Mona Lisa is a “painting”. The building dates back to the early 18th-century, when Emperor Charles VI decided he needed somewhere suitable to put his books. Not for Charles a quick shelf from IKEA. Instead, the Emperor got architect Fischer von Erlach (he of Schönbrunn Palace fame) to design a rather splendid court library. This included the Prunksaal, which reaches almost 80 m in length and over 14 m in width, with a domed ceiling towering almost 20 m overhead. There are, indeed, bookcases within this main hall: huge, tall, Potteresque wooden bookcases guarded by giant mobile ladders. And there are columns: marble and wooden supports, all topped with golden scrollwork. And there are statues: a who’s who of the earlier Habsburgs, with Charles VI himself at the room’s centre in a pose styled after Hercules, leader of the Muses. And giant globes: two pairs of 17th-century celestial and earthly globes by the Franciscan friar, Vincenzo Coronelli. And, last but not least, there are ceiling frescoes. The State Hall is a rich feast of frescoes that draw your eye up and around in unadulterated wonder. This is not a library where you need to put out signs asking people to be quiet. Who would ever wish to disturb the peace of the books in such a magnificent room? The bookcases heave with giant leather-bound tomes, but you can’t get close to them. Instead, glass display cabinets present rarities from the library collection and items relevant to whichever Prunksaal exhibition is currently running. You can only begin to imagine what treasures lurk in the library archives. One item on display is not a copy, though: the ever-changing special exhibit. On my visit, it was Haydn’s 1797 autograph score for his Gott erhalte composition, better known these days as the music of the German national anthem. At the time of writing, a standard adult ticket cost €8, with kids free. The Vienna Pass (see my review) also includes one-time free access to the State Hall. Opening times are daily from 10 am to 6 pm (9 pm on Thursdays, closed Mondays from October to May). 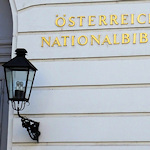 The national library is part of the Hofburg complex, with the entrance to the State Hall off to one side on Josefsplatz. So if you’re meandering around this central area, you’ll likely come across it anyway.